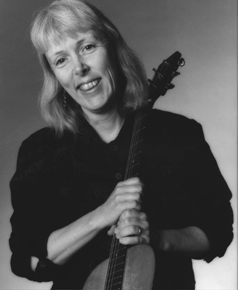 Accompanying herself on guitar, banjo, concertina, or mountain dulcimer, Cindy’s repertoire ranges from haunting traditional ballads to songs by writers as diverse as Jack Hardy and Nancy White, with a few original songs thrown into the mix. Cindy began performing professionally in 1976 and can be heard singing harmony on many albums, including several of Tom Paxton’s recordings. Cindy and her husband Steve Gillette have recorded four duet albums. The first is digitally-recorded Live In Concert (Compass Rose Music), produced in 1991, chosen one of the Top Ten Folk Albums of the year by Rich Warren (WFMT), Mike Flynn (The Folk Sampler), and Tina Hay (WPSU). Their second duet album, The Light Of The Day (Compass Rose Music, 1996), prompted England’s Folk Roots Magazine to comment “still just about the classiest duo around, with more of their sublime traditional and contemporary folk.” A third recording entitled A Sense Of Place (Redwing Music, 2001) focused on New England songs and tunes. Their latest duet CD is called Being There (Compass Rose Music, 2006). Cindy’s first album (on vinyl) was recorded live to two-track, and featured guests Anne Hills, Jan Burda and Fred Campeau. Entitled Long Time Traveling, it was originally released on the Hogeye label in 1983 and was chosen one of the Top Folk Albums of the Year by the Chicago Reader. The album has recently been reissued on CD by Compass Rose Music. Cindy’s solo CD Songlines (Compass Rose, 1993) included both traditional and original material. Hailed by Scott Alarik in the Boston Globe as one of the Top Ten Folk Albums of the year, the album was produced by Pete Sutherland, and featured backup by Steve Gillette, Anne Hills, Priscilla Herdman, Abby Newton and others. Cindy’s 1998 recording, Songs Of Experience (Redwing Music, 1998), is “a collection of traditional folk songs done in an incredibly melodic and intense way…beautiful and powerful” (Friday Morning Quarterback). The album received the Editors’ Choice Gold Star Award from Crossroads Magazine. Cindy’s latest solo CD is Cat Tales: Songs Of The Feline Persuation (Compass Rose, 2005), an album of songs about cats and their people. Cindy is well-known for her collaborations. She has made three recordings in a trio with Anne Hills and Priscilla Herdman. Their first album, Voices (Flying Fish, 1990) has been called “a clinic in harmony…well-conceived, neatly crafted and expertly performed” (Hartford Advocate). The trio’s Voices Of Winter (Gadfly Records, 1997) is a live concert of songs celebrating the Winter season. Their third album, AT The Turning Of The Year, was released in the Fall of 2000. A duet album with Anne Hills, Never Grow Old (Flying Fish), is a recording of traditional songs featuring many guest artists including Gordon Bok, John Hartford, Laurie Lewis, and Tom Paxton. The recording received an Honorable Mention at the 1994 NAIRD awards. Anne and Cindy’s companion album of traditional songs for families and children, Never Grow Up (Flying Fish, 1998), received the Parents’ Choice Award and has been called “the perfect modern folk recording” (Sing Out!). Cindy’s latest collaboration is Fourtold (Appleseed Records, 2003), a quartet album of story-songs with Steve, Anne Hills and Michael Smith. Cindy has made guest appearances on many radio programs including All Things Considered (NPR), Mountain Stage (WV Public Radio), The Folk Heritage (WGBH, Boston), and The Hudson River Sampler (WAMC, Albany), and on the public television series In the Tradition. She has performed at many festivals: Champlain Valley, Clearwater’s Hudson River Revival, Falcon Ridge, Kerrville, Old Songs, Philadelphia, Vancouver, Walnut Valley, and Winnipeg Folk Festivals.